The Skinny: An OK patriotic drama that concentrates on some storylines and characters while strangely ignoring other, perhaps more promising subject matter - like the stuff relating to the film's English title. Likely a more effective film for those who already understand the story of the 72 Martyrs. Some audiences may be exasperated at the recent surge of “main melody” films pushing the heroism and righteousness of modern China’s forefathers, but 72 Martyrs surprises. However, that surprise comes not from the film's quality, but because the film seems to spend a lot of time not talking about the 72 Martyrs. Directed by Derek Chiu, who also helmed the 2007 Sun Yat-Sen drama Road to Dawn, 72 Martyrs is about the failed Huanghuagang Uprising (a.k.a. the Second Guangzhou Uprising) in early 1911, which resulted in 86 dead revolutionaries and an increased resolve by China's rebelling peoples. As only 72 revolutionaries were identified, they went on to be known as the 72 Martyrs, and are now revered in Chinese history. This is a low-budget effort, so huge battle scenes can only be handled offscreen. However, the pathos inherent in the subject should be enough to make this an effective drama. Right? Unfortunately, not really. In 72 Martyrs, we never meet more than ten members of the martyred seventy-two, and we only get to know maybe one or two of them. The film opens in the months preceding the Huanghuagang Uprising, with artist Gao Jian-Fu (Liu Kai-Chi) and newspaperman Pang Da-Wei (Tse Kwan-Ho) heading the local chapter of revolutionaries, who are looking to get rid of Qing magistrate Li Zhun (Eric Tsang). While waiting for the go ahead from Sun Yat-Sen's trusted general Ke Jiang (a.k.a. 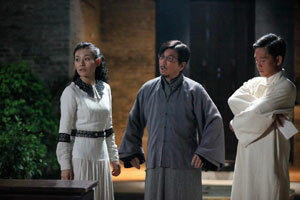 Huang Xing), Gao and Pang meet frequently to discuss their plans, and are soon joined by Luo Zhong-Huo (Zhao Bingrui), freshly arrived from Malaysia where he hung out with Dr. Sun himself. There's an initial feeling out period as Gao and Pang aren't sure if Luo is really there to help, but he quickly ingratiates himself by getting involved with everything that they do. The revolutionaries need money and transportation services to continue their uprising, and Luo is eager to help on both. To obtain funds, Luo gets involved with Jiang Mei-Xi (Irene Wan), the mistress of rich businessman Fang Hong-Zhi (Wang Jianchang). Luo asks for money to fund an orphanage (not really), but the negotiation is sidetracked by Mei-Xi's personal story of how she's not really Fang's mistress and is actually taken care of by Fang because she reminds him of his little sister. She loves him, however, and wants to use Luo as a means to stoke Fang's jealousy. Sadly, her plan does not go well. This subplot is an interesting aside to the story of a revolution, as it takes time, money and clever maneuvering to plan and fund an uprising. There’s plenty of material to explore in the smaller stories surrounding the 1911 Revolution. The problem is that Mei-Xi's story takes up nearly an hour of a 112-minute movie called the 72 Martyrs. Actually, of the film's main seven characters on the revolutionary side, only one was a member of the 72 Martyrs. That ratio seems a bit off. Another problem: way too much Luo Zhong-Huo. Spending time with Luo makes sense because he actually was a member of the 72 Martyrs, but his constant presence seems to lift him above every other character in the film. From fake romancing Jiang Mei-Xi to meeting constantly with Pang Da-Wei and Guo Jian-Fu to flirting with Fang Hong-Zhi's daughter Wei-Ru (Elanne Kong), Luo Zhong-Huo is everywhere, and actor Zhao Bingru doesn't have the charisma to pull off this "star" role. Zhao essays Luo with an odd mix of innocence and smarm, and his throaty line delivery is disconcerting considering that his co-stars enunciate so much better. Also disconcerting is the fact that the film features mostly Hong Kong actors speaking accented Mandarin while playing characters who reside in Guangdong, a Cantonese-speaking province. Still, Tse Kwan-Ho and Liu Kai-Chi perform up to par in the nominal lead roles, and Elanne Kong and Irene Wan turn in decent support. Other than Wan's turn as Jiang Mei-Xi, the other three don't get much drama until the very final act, but by then the film leans on audience familiarity and established history, so achieving effective emotions becomes easier.